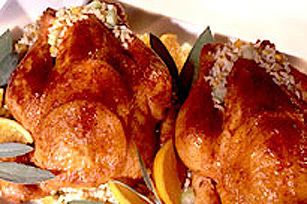 If you love roast chicken, you'll love our Tangerine Cornish Hens. Flavoured with citrus, stuffed and roasted, these Cornish hens make a deliciously simple entrée. SLICE 1 tangerine. Place slices under breast skin of hens. Peel and chop remaining tangerines. STIR tangerines, vegetables, nuts, and sage into rice. Stuff hens with half the rice. EMPTY coating mix into shaker bag; shake hens one at a time to coat. PLACE on rack in baking pan. Bake at 350°F (180°C) for 1-1/4 hours until cooked. Let stand 15 minutes before serving. To serve; cut each hen in half. Serve with remaining rice.